Learn everything you need to know to be a healthy vegetarian or vegan, to ensure you're getting all the nutrients you need to keep your body healthy and in tip top condition. Yes! You can eat an exciting, nutrient packed, healthy, tasty and well rounded diet through just plants alone. In this course I'll show you how easy it can be to start enjoying a healthy vegetarian or vegan lifestyle. I've poured the knowledge from thousands of hours of professional training, hundreds of client consultations and personal experience (read about my past cheese on toast veggie diet below) into this life-changing online course. How to be a Healthy Vegetarian or Vegan includes 10 easy-to-follow video modules, audio recordings for listening on the go, downloadable, printable pdf's and over 30 delicious recipes you can visit again and again for life. "Catherine is like Google in human form!" If you're a committed vegetarian or vegan and you're stuck in a food rut, cooking the same meals over and over again, this course is for you. If you've been a vegetarian or vegan for a while but you're still not feeling as healthy and energy-filled as you expected, your diet might be lacking in certain nutrients. This courses is for you. If you're a mum who feels that your family eats far too much meat, fish or dairy, and you want to know how to use more plants in your diet, without your kids or hubby turning their noses up, this course is for you. If your child or partner has decided they want to be vegetarian or vegan, and you don’t have a clue where to start in supporting them, this course is for you. If the answer is yes to any or many of the above, then I have made this course for you. It’s clear from research that there can be some really great health benefits to following a plant-based diet. However, the choices you make and what you put on your plate is crucial. You need to do your research to make sure you give your body all the nutrients it needs. It’s not enough to simply cut out the meat, fish, eggs, or dairy and hope for the best. In fact, if you don’t replace the nutrients in those foods with suitable plant alternatives, you could be putting your health at risk. "In my clinic I often see vegans and vegetarians who don't plan their diet properly; suffering from health conditions such as: anaemia, poor hair quality, lack of energy, difficulty sleeping and very often gut problems. This doesn't have to be your destiny. Let me show you how" ~ Catherine Jeans. There’s so much information out there about how to follow a non-meat diet, and it can be confusing at times to know which path to follow. 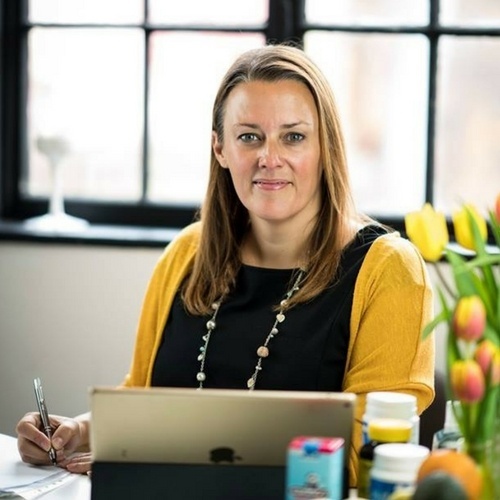 I’m Catherine Jeans and I’m proud to be one of the UK's leading Nutritional Therapists, having worked with 1,000s of clients. Many of these people are vegetarians or vegans – and what I see in my clinic is that the wrong type of plant based diet can lead to serious health implications. You CAN eat well on a plant based diet, but you need some know-how to get you started. "I just want to say thank you for all your help, I would not be where I am today without it, would recommend you to anybody without you I would not be on the path to recovery. Thanks again." Unfortunately, I was a “cheese on toast” vegetarian for over 10 years (are you one of those?) and it left me with serious gut issues in my early 20's, on steroids and putting on weight fast. Luckily I don’t have an inflammatory bowel condition any more, and I follow a diet that includes a lot of plant based food, but in a much healthier way. How to be a Healthy Vegetarian or Vegan empowers you to take your knowledge of plant based nutrition beyond ‘cheese on toast’ and ‘meat alternatives’,’ showing you that with a little planning, knowledge and commitment, you can create a very healthy and exciting diet focused around plant foods. "Catherine has a world of knowledge and experience at her finger tips and relays this in a way that is easy to understand and follow. At a time where changes to diet and lifestyle could be very overwhelming...Catherine gives suggestions that are realistic and attainable"
So what's it all about hey? Access to The Healthy Vegetarian or Vegan Facebook group: This part of the course is totally invaluable.. Not only will you become part of a community of like minded individuals, searching for practical guidance and feedback on how to eat well with plants.. You’ll also get access to me… I will be answering any questions you have, giving you motivational tips and providing you with new recipes and chapters. You get LIFETIME access to the course, with any upgrades and additional material that comes with it. No extra fees to pay, just a one off payment that provides you with hundreds of pounds worth of expert guidance. Why do I do it at this price? I want to help you enjoy a lifestyle not a ‘diet.’ One that supports optimum health through plant based foods so that you can enjoy your food and also feel amazing! How to be a healthy vegetarian or vegan is a simple, effective online course that will help you to embrace a plant based lifestyle by giving you all the practical steps to achieve this. Whether you are a lifelong plant eater, at the start of your vegan or vegetarian journey or simply keen to eat more plants and less meat, this is an excellent first step to getting the knowledge you need. Because you follow the course at home, you can make simple changes at your own pace. With 10 easy to follow modules, complete with audio for on the go listening, shopping lists, delicious recipes and expert guidance, you can enjoy a lifestyle with huge health benefits that is not only ethically focused, but more sustainable. "I just made and tasted the Vegan Millionaires shortbread and it's better than any I've ever tried before. I love knowing that I can enjoy delicious recipes that allow me to follow a plant based lifestyle and still really enjoy my food"
Supplements – should you be taking them? Grab all 3 of my best selling online nutrition courses for 1 great price! I'm Catherine, one of the UK's most experienced and highly trained Nutritional Therapists. I'm also a busy Mum of 2, so I know what it's like trying to balance healthy meals around a busy home life. I believe that good, healthy food doesn't have to be complicated, and I've worked with over a thousand clients in my private clinic, and taught them how to eat well for life, in an achievable way. I now spread my message of healthy, happy eating around the world with my online courses. I love teaching people that healthy eating doesn't have to be a sacrifice... that you can eat well, feel great and thoroughly enjoy your food! You can find loads of testimonials on my website www.thefamilynutritionexpert.com... here's just a couple I wanted to share with you: "Before I saw Catherine, I felt constantly tired and was struggling to get on with everyday life. I hadn’t realised that what I was eating was making such a huge impact on the way I was feeling." Mrs C, Norfolk. Video: How to use this course and why go vegetarian or vegan?